Alicia Townsend travelled through 10 different countries and 19 cities to land her dream job. She shares her experience below. The day had arrived, December 29, 2017. Excitement, anxiety, nervousness, anticipation and enthusiasm were just some of the many mixed emotions I felt as I boarded the plane from Brisbane International Airport. I began my European audition tour by basing myself in London. Here I was able to take multiple classes at Pineapple Dance Studios and Danceworks, while recovering from the jet lag and making sure I was in prime shape for my auditions. My first destination was Warsaw, Poland. If you book far enough in advance, you can find some really cheap flights. My flight from London Stansted Airport to Warsaw with Ryan Air cost me $25! It was a big help that I only had hand luggage (I was returning to London after travelling to Poland and Hungary). Tickets can increase by four times the amount if you check in luggage… but still cheap in the scheme of things! The only issue with booking cheap transport fares and accommodation in advance is that your audition schedule is likely to change, especially if you are still waiting to hear back from companies or are still contacting them while you’re overseas. The companies can take a long time to get back to you regarding auditions, so don’t give up hope and don’t be afraid to send multiple emails. I loved my time in Poland, although I must admit that the first day was very daunting and overwhelming. I found myself in a country that wasn’t English speaking (with very little English signage), bitterly cold (snowing), lost with no phone battery and struggling to understand how the transport system worked. Despite feeling completely overwhelmed, it wasn’t long before I started to get the hang of travelling in foreign countries. After travelling from Warsaw to Budapest, Hungary, one of my favourite cities, it was back to London for a few days before flying to Athens in Greece. This audition for the Greek National Opera Ballet Company was bittersweet for me as I was next in line if the chosen female declined her offer. There were roughly 300 females and 100 males at the audition, however only one female and two males were chosen. So close yet not close enough, but it was a good confidence boost and of course a great learning experience. Thankfully and luckily, I had booked to stay for an extra one and half days in Athens as the audition day lasted from 9.30am to 6pm — a long day indeed! I was chosen to present a classical and contemporary variation at this audition, so always be sure to pack extra leotards, skirts, footwear and music. Although specific auditions should warn you if they hope to see a variation, some auditions may not, so always be prepared. Lausanne, Switzerland, was the next port of call. I was able to watch the Prix de Lausanne, a competition I never thought I would have the opportunity to view live. Thanks to Europe’s incredibly efficient transport system, I was able to dash across borders to Dortmund and Hannover in Germany for two days. Following my audition for the Staatsoper Hannover, a male dancer and I were lucky enough to be chosen to work with the director, Jorg Mannes. Here we had the chance to learn and present some brilliant contemporary repertoire both in solo form and pas de deux, which he filmed. It was a tiring day but a wonderful experience. During my interview with Mr Mannes, he explained he was receiving 30 to 40 applications a day, even after the open audition. He also said that due to the large volume of applications, he had to reject many applications without even looking at their resumes, as there were just too many. So my advice is to send your audition applications as soon as possible and if it is too early for a particular company, you can always send it again later — it’s better than missing out! I then returned to Switzerland just in time for the grand final of the Prix de Lausanne. After spending a day off in the Swiss Alps (an unforgettable experience I would recommend to anyone), I caught a train from Lausanne to Geneva, followed by a flight to Barcelona in Spain, in preparation for the Grand Audition. 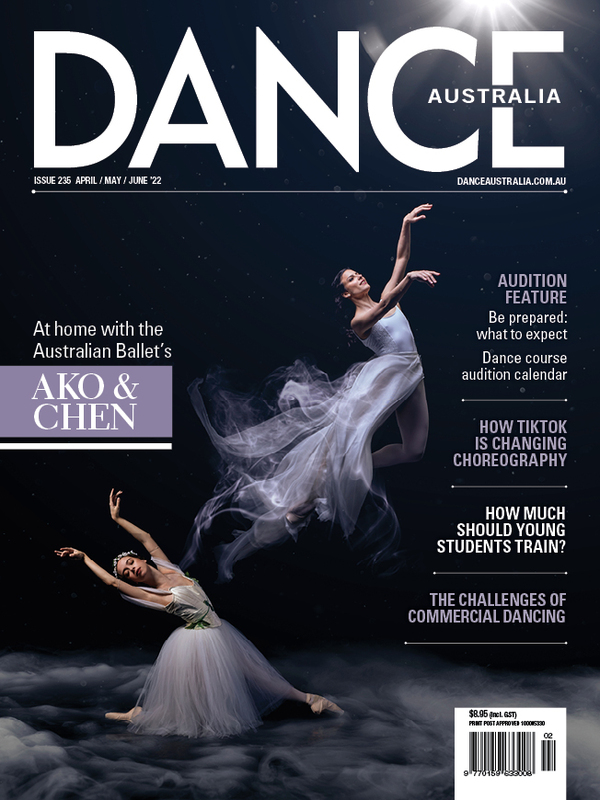 (To find out more about Grand Audition, please read Annette Roselli’s article in Dance Australia’s February/March issue). Spain was wonderful! It’s a fun and vibrant country and seemed to be very “foreigner friendly”. It was then time to visit Prague in the Czech Republic for the Czech National Ballet audition! Unfortunately I was only in this stunning and historical city for 24 hours before I had to jump on a 20.5 hour-long bus to Nice, France. Throughout my 10-week audition journey, I always tried to ensure I arrived at my destination the day or night before. However, due to the auditions in Prague and Nice being back to back and so far apart in distance, I had no choice but to get off the bus and go straight to the Ballet Nice Mediterranee company audition. I’m glad I arrived dressed and ready, as we spent hours waiting and then registering outside in a car park in the freezing cold before we could go inside. It was then a very quick rush for those in the first group. I was thankful to be in the second group; however, I still didn’t have much time to warm up my body and fingers and toes, which were numb from waiting in the cold. Always be prepared in case you don't have much time. Unlike others, I always arrived at my auditions with my hair and make up done in case of instances like this – or you might get lost travelling to the audition and arrive later than expected. After two days of rest by the Mediterranean Sea, exploring stunning Nice and Monaco (another country you can visit by taking a 45 minute bus ride from Nice), it was time to get back to dancing and auditioning. I travelled by bus (again!!!) from France to Dresden in Germany where I took class with the Semperoper Ballet and stayed with an old friend of mine for a night. It was then back on the bus to travel to Brno and Ostrava in the Czech Republic. This was a big weekend, as I made it through to the final round of auditions for the Ballet of the National Theatre Brno before I had to travel by train to Ostrava that evening to audition for the National Moravian-Silesian Theatre. Despite a late night and feeling extremely sore from the intense contemporary that we had to learn and perform the day before, it was in Ostrava that I was offered a contract. It was another long audition day – class, presentation of classical variations, more challenging contemporary to be learnt and performed and then interviews. I was not offered a contract on the spot as the company had another three weeks of private auditions after the open audition so I received my offer via email while on the flight home to Australia. I had to rush from the theatre to the train station and travel by train and bus to Germany to take class with Essen Ballet. Unfortunately, after two long audition days and travelling in between, the travel to Germany didn’t go so well. Let’s just say I thought I would be spending the night sleeping on the streets of Prague... I learnt from the disasters that unfolded that evening that I must allow myself plenty of time for connections. I had a nine-minute drive between the train and bus station in Prague with a connection time of 45 minutes. It should have been plenty of time, but my train being delayed by 40 minutes, I missed the overnight bus to Germany and had an emotional breakdown, feeling stressed and exhausted. In saying this, Europe’s transport system is brilliant and I had never before experienced a delay like this (the odd train might run three to five minutes late) but otherwise they normally run to the exact minute... I guess I was just unlucky this time. My trip ended with auditions in some amazing cities such as Munich, Leipzig, Greifswald (Germany) and Stockholm (Switzerland). Although I travelled to some of the most beautiful places in the world, it definitely was not easy, especially being alone. By the end, I was exhausted emotionally and physically and I was also feeling extremely lonely. I met and stayed with some old friends of mine when I could – which I highly recommend doing, especially if you’re like me and enjoy being surrounded by people you know. Airbnb was amazing. Not only did it save me a lot of money but also I got to meet so many new people and experience the different styles of homes and flats in each country I visited. What I learnt from some not-so-pleasant experiences of mine is to ensure you have a strong and sturdy suitcase (mine broke while trekking through a snowy field). Also be sure to have plenty of battery on your phone and keep it warm (particularly if you have an iPhone), as the cold made mine shut down, even with a 90% full battery, while I was lost in a small, deserted German town. I would also like to warn you of the debacle that can occur if you don’t have a return flight and accommodation booked and a substantial amount of money in your bank account (with proof). Airport, train and bus security is intense these days, as all countries are on high terrorist alert. I witnessed many police officers checking traveller’s bank accounts, booked flights, and so on. I myself was interrogated by officers and was almost not permitted to re-enter the United Kingdom. Luckily my audition email invitations came in extremely useful when being questioned about my travels to 10 different countries and 19 cities, so be sure to have them nearby and accessible. Overall, my audition trip was liberating and exhilarating – an experience I will never forget. I feel so very grateful to have been offered a full company contract and achieved my dream of becoming a professional ballerina. Be sure to always introduce yourself to the director (especially if auditioning privately) and take a spare copy of your resume with you. Pack spare dance gear (classical and contemporary) and music (on CD) for your audition. Take your passport to each audition with you as some companies like to scan it if they are interested. Do carry a battery pack with you incase your phone dies (highly recommended). Take a suitcase if possible. I suggest a big “backpackers” backpack that is easy to transport up and down stairs and through the snow. Rely on being able to wear a skirt. Book your accommodation and transport too far in advance unless you are sure that your schedule won’t change. In saying this, also don’t leave it too late as you might miss out on convenient accommodation. Alicia Townsend has accepted her full company contract with the National - Moravian Silesian Theatre and will begin mid-August.